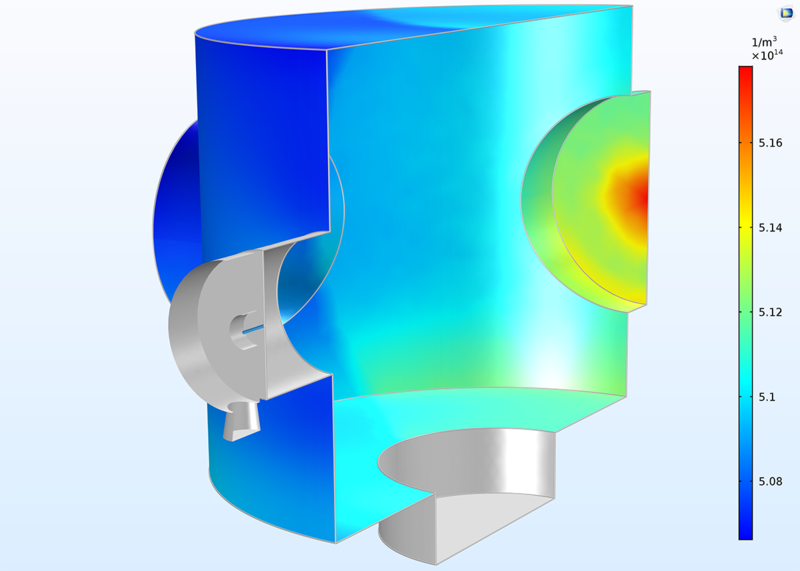 For users of the Molecular Flow Module, COMSOL Multiphysics® version 5.3 includes a new Plane Symmetry boundary condition for modeling symmetric geometries and a new turbomolecular pump tutorial model. The new Plane Symmetry boundary condition has been added to allow specification of a symmetry plane in 2D, 2D axisymmetric, and 3D models. When symmetry exists, this feature allows for only half the geometry to be meshed and solved for, which can significantly reduce the CPU and memory requirements for large models. Number density (1/m3) inside a vacuum chamber fed with a small capillary tube, modeled using half the geometry with a Plane Symmetry. 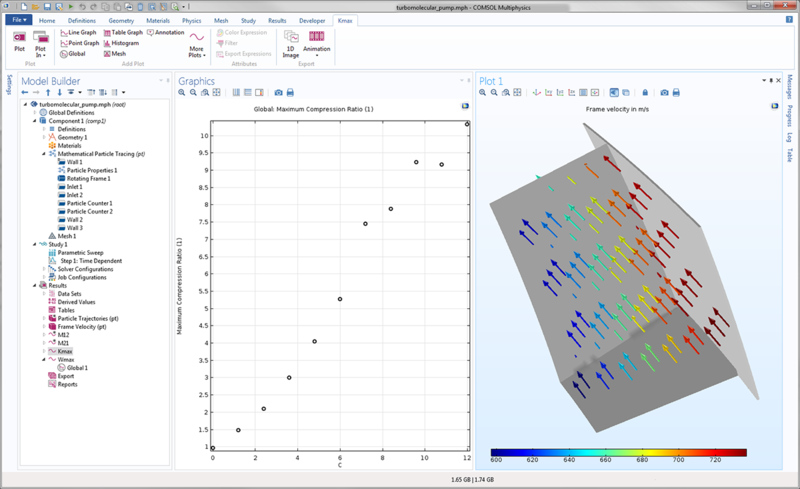 The Free Molecular Flow interface available in the Molecular Flow Module is an efficient tool for modeling extremely rarefied gases when the gas molecules move much faster than any geometric entities in the domain. For turbomolecular pumps, in which the blades move at speeds comparable to the thermal speed of the gas molecules, a Monte Carlo approach is needed. In this example, the trajectories of gas molecules are computed in the empty space between two rotating blades of a turbomolecular pump. The model uses the new Rotating Frame feature, which applies centrifugal and Coriolis forces to the particles, allowing the trajectories to be computed in a noninertial frame of reference that moves with the rotating blades. The effect of the blade velocity on the compression factor is shown using a Parametric Sweep. Note: The model in the example also requires the Particle Tracing Module. Screenshot of the Turbomolecular Pump tutorial model. As the blade velocity increases, molecules have a higher probability of being transmitted forward through the pump and a lower probability to be transmitted backward, as shown by the increasing compression ratio. Screenshot of the Turbomolecular Pump tutorial model. As the blade velocity increases, molecules have a higher probability of being transmitted forward through the pump and a lower probability to be transmitted backward, as shown by the increasing compression ratio.